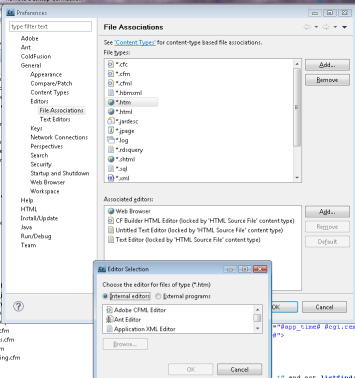 The solution for getting CFB to open an HTM file in the CF editor is not too hard, but since he was thrown off a bit by some things he saw (when I suggested simply that the answer was in Builder's Preferences>General>Editors>File Associations page), I offered the specific steps. I then decided to go ahead and blog it, since I don't find anyone else having done so (feel free to comment if someone did). Note that this solution applies as well to CFBuilder 1. Before I proceed to explain the editor setup, I'm sure some reading this will want to stop and either ask about or warn against(!) this idea of someone setting up their server to have htm files processed by CF. It's one of those things that have either delighted or appalled people over the years. I don't want to get into the discussion here, but it's a worthwhile one, so I will offer that in a follow-up entry-- yes, including how to do it if you want to, and yet also why some would say you should think twice (and how you might address their concerns.) Update: here's the link to that follow-up blog entry. In the *lower* pane ("Associated editors"), click "Add"
Choose "Adobe CFML editor" and click "ok"
It's that simple. Note that these changes do not require a restart of CFB to take effect. I'll add that if you don't make this the new default editor for htm files (the last step above), you can still find it listed as an option for editing an htm file, by right-clicking that file in the navigator and choosing "open with". The context-menu dialogue will now list "Adobe CFML Editor" as an option--indeed it will be first in the list, since that context menu lists editors in alpha order. That's it. Let me know if the steps above may have helped you, or if you may some comments/corrections. Before concluding, the customer shared a couple of other related thoughts, when he thought this couldn't work and he was explaining why he might go with another editor. I addressed them as well, so I thought I'd share them here as well. First, he didn't like that with CFBuilder you "have to create a file before hand", meaning when you create a new file, it asks you to give it a name and location within a project. Actually, you don't HAVE to do that in CFB, at least for HTM files and some other extensions (though NOT cfm files). There's an option that many miss. Take a look at File>New>Other>Untitled Files. Since he would now have setup CFB to process htm files as CFM files, this could indeed work for him. I address that feature (and others) in my "Hidden Gems in CFBuilder" talks, both for CFB1 and for CFB2. Second, he expressed concern about the price of CFB, noting that the alternative he was considering (Coda, for OS X, which does have CFML support) cost only $99. The implication was that CFB is more expensive. And thank you, Tim, for the encouragement. I had not yet tweeted the entry because I wanted to get that follow-up article out. I just did, so I'll share the news more widely. It's late on a Friday, so sadly it may not catch much attention at this point. We shall see. Thanks for showing how easy that was. I'll check out the follow up post.